Barilla Protein Plus Pasta (yellow box)... if you haven't tried it - buy it this week. Here's the deal... I'm Italian... I grew up with a family sauce and meatball recipe passed down from my Great Grandmother. I love pasta. Love it. White pasta... while delicious... is not the best for every day eating. Barilla Protein Plus Pasta, on the other hand, is healthy and guilt free. Here's the label. 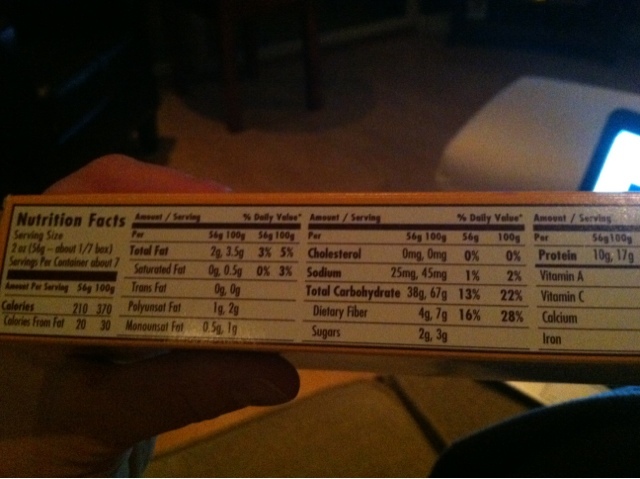 As you can see, there are 10g of protein in a 56g serving. There are 4g of fiber, just 2g of sugar, PLUS what you can't see on this label is that there are 360mg of Omega-3. (And the 'fooducate app' gives it an A- rating!) Download this app if you want help with your shopping list - it's so cool!) Oh and I just think it tastes better than whole wheat pasta so that's also why I recommend it. Anyway, using this pasta instead of white with any of your recipes is already making it healthier, however, using olive oil, veggies, and a lean protein, will make it super healthy. This pasta is also great for vegetarians because it has a nice amount of protein that even most whole wheat pasta's do not have. *Please note that my ingredient list is for a single serving - easy to double/triple/quadruple, etc. 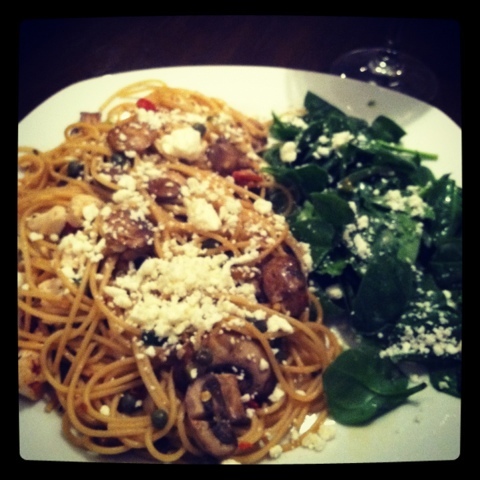 By my calculations, the way I prepared this tonight, it had about 390 calories. You've probably heard of Interval Training or HIIT (high intensity interval training). These workouts are GREAT for burning the maximum amount of calories possible in a short period of time. HIIT workouts are a bit more intense than regular interval training and I'll get into that in a later post, but, here's an interval to try tomorrow (especially if you're an elliptical person). - 3 minutes at the highest resistance you can possibly manage to move the pedals and handles... you should look like a gazelle in super slow motion, but, you'll feel it. I'm talking slow... you might look funny but who cares... that person next to you at a 4 and having a full fledged conversation on their cell phone with no problem and no shortness of breath - has nothing on you. Get on that treadmill and warm up for 5 minutes at a medium pace then fly for 3 mins, jog or walk for 2 mins, repeat until you hit 30 mins. GREAT workout.